I knew I would love this book. But I also should have waited. Because it is too short. And I need more. And I need it now. I want to read all five books right away. <3 Sigh. The wait for book two will be torture. But I can always re-read this one, as it is short and fun and heartbreaking and so good. <3 I loved it. Want to start by saying that I adore books by Cassandra Clare. And I thought this one sounded amazing when I first heard about it ages ago. I knew I would love it. And I did. And I'm so glad for that. But oh. It was such a fast read book and I didn't want it to end. Yet it was also the perfect length. Probably. I'm not sure what I want to share about The Iron Trial. As it isn't very long, and I don't want to write out the plot. But I will say a few awesome things about it. It is written from the point of view of twelve year old Call. And oh, how I adored him. He is the best main character. Just so cute and broken. He has a damaged leg. And it is so sad and I loved it to pieces. I like my characters to be a bit damaged. And I felt so sorry for Call. As he gets bullied a lot and he doesn't have any friends. It all just made me so sad. Sniffs. But it gets better. Probably. I'm still a bit unsure about it. Though my love for Call continued to grow for each page. Callum is just my favorite character. And I loved getting to know him in this book. Though getting to know him more in the next books will be the best. Sigh. I just hated how some people treated him. There were some very not-nice people. Like Jasper. Though I kind of grew to like him, as he is twelve, so he ain't that bad at bullying. I didn't like the way Aaron and Tamara was with Call at first. Not nice. Giggling and having fun once he leaves the room. Things like that break my heart. Yet so awesome. But at the same time I did love the growing friendship between Call and Aaron and Tamara. It is sweet to read about. Yet also too little about it. Grrr. Wishing this book had been longer. Still. I know enough. And I did adore them all. There are other characters in this book too. Like the cutest little wolf. And a bunch of others that I enjoyed reading about too. I would love to know more about Callum's dad. We saw him a little in the beginning, and I'm curious about him. He's different. But he also really loves Call. There is magic in this book. And a school. Underground. And it is all kinds of awesome. I just loved everything about this book. Except for the length :D But anyway. I really enjoyed the magic parts of this book. <3 It's different and it's fun. I liked it a lot. A bit creepy too. Though I suspect it will become even more creepy as the series go on. Ack. And I cannot wait. I just cannot wait to read more about Call and everyone. I want more now. I'm also really hoping book two will be much longer. <3 Writing is stunning. 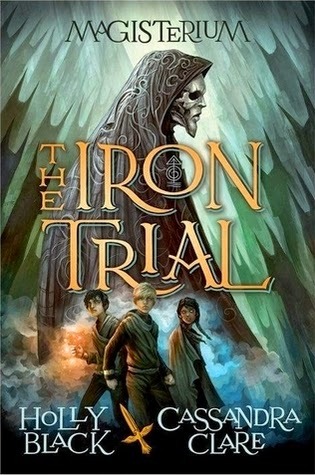 The Iron Trial is an excellent book. It is fun and sweet and heartbreaking. There is magic. There is friendship. There is danger. This book was just all kinds of amazing. And I'm so glad that I read it. <3 Though yeah. Too long until the next book is out :D I just cannot wait to read more. I just know that this series will get a big place in my heart. <3 Because yeah. Callum is the most awesome hero. Also. The ending. I didn't peek :D And I was surprised. And a bit confused. But it was also all kinds of awesome. The magic sounds unique and interesting! I haven't heard too much about this book, but I'm curious now. This book still sounds like a rip off from other stories.. so I'm not sure how I feel about this, especially with Cassandra's other history of books. I'm happy you could enjoy it though! I'm so happy to hear you loved this one, Carina! It was really interesting the take on magic that Cassandra & Holly decided to go with, and also the unexpected twists they threw here and there! So glad you liked this. Me too. Having two such awesome writers collaborating makes it even better. And glad they decided to write a MG story for a change. Can't wait for book 2 as well.